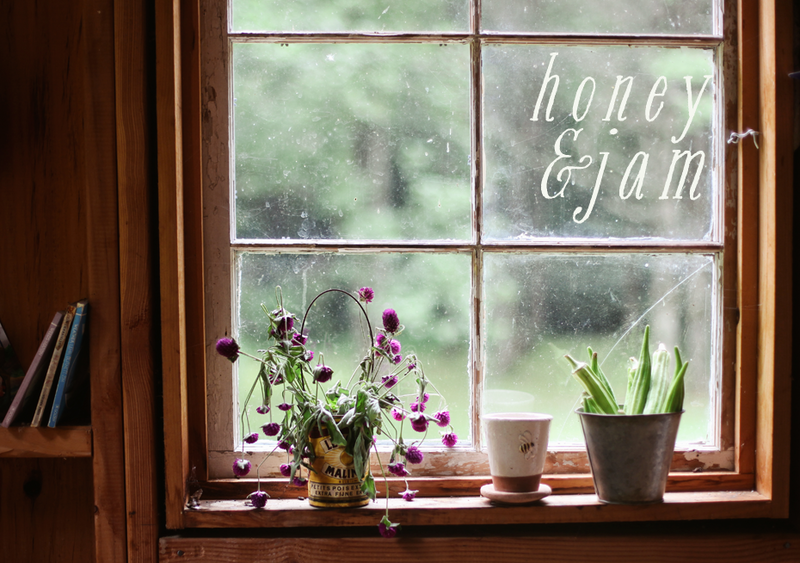 honey & jam | recipes + photos: lemon bars. A while back, when fruit was still plentiful, my sister Sarah asked me to make lemon bars. I’d forgotten all about it until I was walking around the produce section at the grocery store, begging something to pop out at me. All the fruit looked so sad, tiny and shriveled, begging for summer to return. But the lemons! They were so...robust. And they were calling my name. 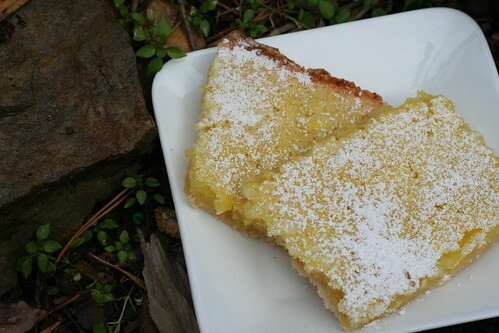 I was searching high and low for a good lemon bar recipe, I finally decided on this one from allrecipes.com. It’s not perfect, it’s a little too tart and a little too thin, but it worked. I’ll just be sure to add more sugar next time. Preheat the oven to 325 degrees F (165 degrees C). In a medium bowl, mix together the flour, 1/3 cup of confectioners' sugar, and butter until butter is in very small crumbs. Press into the bottom of a 11x7 inch pan. Bake for 25 minutes in the preheated oven, or until firm and lightly browned. While the crust is baking, whisk together the eggs, 2/3 cup of confectioners' sugar, lemon juice and lemon zest in a medium bowl. Just before the crust is done, stir in the baking powder. Pour over the crust while it is hot, and return to the oven. Bake for another 25 minutes in the preheated oven, until set. Dust with remaining confectioners' sugar when cool. mmmm. i just adore lemon bars. yours look delicious, especially with all that yummy powdered sugar on top! these look so refreshing! you take great photos! They look great! One of the twins was just asking me yesterday to make him some. 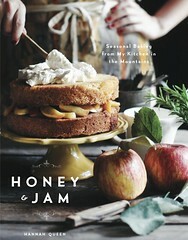 I'll give your recipe a try, keeping in mind your suggestion to add some more sugar though I do like mine tart! Ooh, I like them tart. Looks great! I just found your blog, and I have to tell you, you have a wonderful eye. Your photos are stunning. And not just the ones of food, either. You can tell right away what a creative girl you are. Keep up the great work! Absolutely delectable. Drool-worthy. They look sooo good!! I love all things lemon. Gorgeous photo! 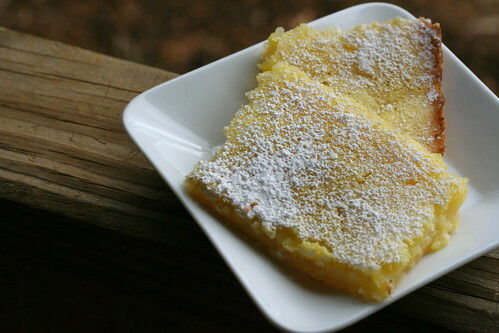 Your photos look amazing - lemon bars are one of my favorite things. Personally, I like the tart kind so yours sound good. If you want a bit thicker lemon filling part, you might try making it more like a curd - add a couple egg yolks and cook it a bit on the stovetop to thicken before throwing it all back in the oven. I'm on a 7 day cleanse right now and have drank a lot of lemon water, but your bars are definitely a better way to use lemons. Can't wait to try them myself. Lemon Bars, or Squares, as my family calls them, are a family tradition. My older brother is the official king of Lemon Squares. They're always so wonderful! Would you be interested in our recipe? I would love the recipe, Emma! Hi Hannah, I just made some lemon bars using a recipe from the folks at America's Test Kitchen. They turned out AWESOME (http://gastronomyblog.com/2009/02/21/lemon-bars/) Definitely give it a try sometime!